Wikimedia Commons has media related to Heraldry of Spain. Illustration from a manuscript grant of arms by Philip II of Spain to Alonso de Mesa and Hernando de Mesa, signed 25 November 1566. Digitally restored. The Spanish nobility, unlike their other European counterparts, was based almost entirely on military service. Few families of eminence came from the law, commerce or the church. The great families of Spain and Portugal fought their way to their rank, which allowed commoners to join the ranks of the nobility through loyal and successful military service. Many poor families came to prominence and wealth quickly as a result of their successful military exploits. In Spanish heraldry, arms are a symbol of lineage and a symbol of the family as well. Spanish arms are inheritable like any other form of property. The descent of Spanish arms and titles differs from much of Europe in that they can be inherited through females. Also, illegitimacy did not prevent the descent of arms and titles. The great Spanish families believed that a family pedigree could be more damaged by misalliance than by illegitimacy. Indeed, the patents of nobility of many Spanish families contained bequeathals to illegitimate branches in case no legitimate heirs were found. Illegitimacy in Spain was divided into three categories. Natural children: Those born of single or widowed parents who could be legitimized by the marriage of their parents or by a declaration by their father that they were his heirs. Spurious children: Those whose parents were not in a position to marry. These children had to be legitimized by a petition of royal ratification. Incestuous children: Those born of parents too closely related to marry or who were under a religious vow. These hijos required a papal dispensation in order to inherit their parent's arms or property. These papal dispensations were granted so often that every diocese in Spain had signed blanks ready to affix the appropriate name. Spanish heraldry style and practice follows the Iberian branch of the Latin heraldry tradition, that also includes the Portuguese heraldry, with which it shares many features. The most common shape of heraldic shield used in Spain is the Iberian style (also referred as "Peninsular", "Spanish" or "Portuguese") which has a simple shape, square on top and round at the bottom. The charges shown on Spanish armorial bearings can depict historical events or deeds of war. They are also characterized by a widespread use of orles and borders around the edge of the shield. In addition to borders, Spain and Portugal marshal arms more conventionally by quartering. The Iberian heraldry also allows words and letters on the shield itself, a practice which is considered incorrect in northern Europe. Crests and helmets are also common in Spain and Portugal. 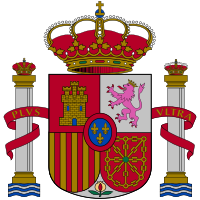 The "coat" of arms, or more correctly the achievement, in Spain is composed of the shield, a cape which can be simply drawn or ornate, a helmet (optional) or a Crown if for a member of the nobility and a motto (optional). In Spanish heraldry, that which is placed on the shield itself is the most important. In English, Scottish and Irish heraldry one can find many additional accessories not often found or used in Spanish heraldry. They can include, in addition to the shield, a helmet, mantling (cloth cape), wreath (a circle of silk with gold and silver cord twisted around and placed to cover the joint between the helmet and crest), the crest, the motto, chapeau, supporters (animals real or fictitious or people holding up the shield), the compartment (what the supporters are standing on), standards and Ensigns (personal flags), Coronets of rank, insignia of orders of chivalry and badges. In general, the older the arms, the simpler or plainer is the achievement. The Chronicler King of Arms in the Kingdoms of Spain was a civil servant who had the authority to grant armorial bearings. The office of the King of Arms in Spain originated from those of the heralds (Spanish: heraldos). In the early days of heraldry, anyone could bear arms and as is normal where human beings are involved there arose disputes between individuals and families. These disputes were originally settled by the King, in the case of a dispute between nobles or by a lower ranked official when the dispute involved non-nobles. Eventually, the task of settling these disputes was passed on to officials called heralds who were originally responsible for setting up tournaments and carrying messages from one noble to another. The Spanish Cronista de Armas heraldic office dates back to the 16th century. But prior to that, heralds were usually named after provinces and non-capital cities, whilst reyes de armas were named after the Spanish kingdoms. Various chroniclers of arms were named for Spain, Castile, León, Frechas, Seville, Córdoba, Murcia, Granada (created in 1496 to honor the reunification of Spain), Estella, Viana, Navarre, Catalonia, Sicily, Aragon, Naples, Toledo, Valencia and Majorca. While these appointments were not hereditary, at least fifteen Spanish families produced more than one herald each in the past five hundred years (compared to about the same number for England, Scotland and Ireland collectively). The Spanish Cronistas had judicial powers in matters of noble titles. They also served as an accreditation office for pedigrees and grants of arms. The post of King of Arms took several forms and eventually settled on a Corps of Chronicler King of Arms (Cuerpo de Cronista Rey de Armas) which was headed by an Elder or Dean (Decano). It usually consisted of four officers and two assistants or undersecretaries which usually acted as witnesses to documents. The entire corps wore a distinctive uniform. The corps were considered part of the royal household and was generally responsible to the Master of the King's stable (an important position in the Middle Ages). The precise functions and duties of the King of Arms were clearly defined by the declarations of several Kings and are still in force today. In modern times the Corps of Chronicler King of Arms went through several changes. Important changes were made in 1915, it was abolished in 1931 and restored in 1947–1951. The last Chronicler Kings of Arms appointed by the Spanish Ministry of Justice was Don Vicente de Cadenas y Vicent, died in 2005. The government of the autonomous community of Castile and León has appointed Don Alfonso Ceballos-Escalera y Gil, Marques de la Floresta and Vizconde de Ayala as (Chronicler of Arms for Castile and León). Don Alfonso also serves as personal heraldic officer to the King of Spain. Formerly, everything that the Spanish heralds do must be approved by the Ministry of Justice. However, more recent legislation has established the Cronista de Castile and León as the modern equivalent of the Spanish King of Arms with the authority to make grants of arms to citizens of Spain and individuals from families associated with its former colonies without reference to the Ministry of Justice. Like most European countries, Spain has a national coat of arms. Many cities also have civic coats of arms; some are recent grants, others date back to the medieval period. Toledo, in previous periods the most important city of Spain, has a particularly elaborate coat of arms; it uses the double-headed eagle of the Holy Roman Empire as supporter on its coat of arms; this represents its former importance and power. Madrid, the capital, has a less elaborate coat of arms, depicting a bear taking fruit from a tree. Coats of arms are regularly depicted on various buildings and objects belonging to national or local government; in Madrid, even such unglamorous objects as manhole covers are decorated with the civic coat of arms. Some ancient Spanish families bear personal arms. 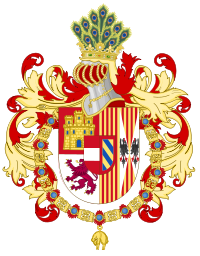 The Dukes of Alba, historically among the most powerful noble families in Europe, bear an elaborate achievement of arms, featuring the 'arms of justice' symbolising their hereditary office as Constables of Navarre. The monarch and the heir apparent have their own personal coats of arms. Spain originally had a corporation of heralds (Spanish 'cronistas de armas') linked with the royal palace. However, the Spanish body of heralds was abolished in 1931 with the establishment of the Second Spanish Republic. Since the restoration of Juan Carlos I in 1975, Spain's first post-republican herald has been appointed. As in other European nations, arms are regulated, and it is unlawful to assume arms belonging to someone else. Spanish coats of arms are divided in the same fashion used by other European countries. Since coats of arms were granted to new separate families, there was the need to join multiple coats of arms into one when a new branch of a family was formed. Thus Spanish escutcheons are commonly parted. The tradition of differentiating between the coat of arms proper and a lozenge granted to women did not develop in Spain. Both men and women inherited a coat of arms from their fathers (or a member of a clan who had adopted them). In the case of women they could also adopt the arms of their husbands. Francisco Franco, Decreto del 13 de abril de 1951. ^ Official Heraldic Authorities at The International Association of Amateur Heralds. ^ Francisco Franco, Decreto del 13 de abril de 1951. ^ Cronista Rey de Armas of Castilla and Leon. This page was last edited on 7 April 2019, at 15:13 (UTC).